The company maintained a 56 percent share in the December quarter and topped 50 percent annually for the first time in 2018, Canalys said. Apple's closest competitor on an annual basis was Sharp, a distant second at 11 percent -- Sharp and other local Android brands, like Sony, are in fact said to be under increasing pressure from foreign competition, namely Samsung, Huawei, and Google. 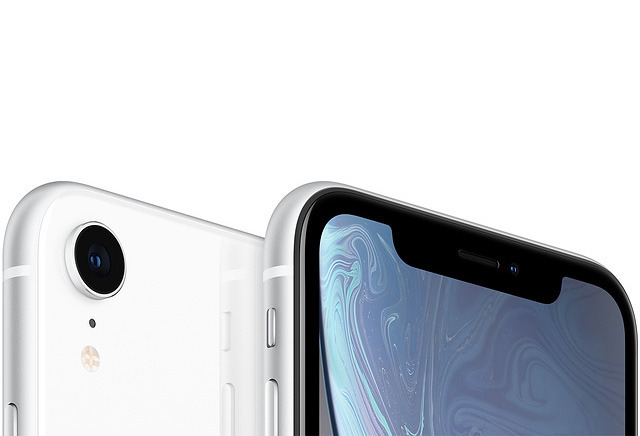 The iPhone XR accounted for 39.8 percent of Apple's calendar Q4 shipments, Canalys estimated. This was, however, because of "aggressive subsidies" from carriers, meant to offset lower demand for the iPhone XS and XS Max due to their high prices. The latter two phones are said to have done poorly, together seeing only 1.4 million units, worse than the iPhone X did in its launch quarter. Pricing was a significant factor in Japan. Apple's average sales price (ASP) fell to $744 versus $794 a year ago, and 2015's iPhone 6s actually saw shipments increase thanks to local carrier NTT Docomo, which used the device in a low-cost subscription plan. "The biggest challenge for Apple in 2019 is to retain its dominance amid downward pressure on operator subsidies, the rising secondhand market and increasing competition from vendors such as Huawei," Canalys concluded. Apple hasn't been faring well in two other major Asian markets, China and India. The company controls just 1 percent of the Indian smartphone market, and Chinese sales dropped 26.7 percent in Q4. In each case a primary cause is believed to be low-cost competition. Japan culturally have a history of well made manufacturing of items. Their cars are the most reliable and their pottery and instruments and tools are the best in the world. It’s no surprise they’d have an appreciation for the iPhone. I just wish Apple would consider brining the pricing back to something that resembles near affordable for the rest of us. And bring out a smaller phone. It’s great that Tim Cook can give all his nieces and nephews new Apple gear, with his $750M, but the average person just wants an iPhone without having to give Apple all of their money. Apple execs need a dose of the real world, and they need to prove with their actions that, “leave the world better than we’ve found it” isn’t just PR spin, but is grounded in some reality which effects people who inhabit this world which Apple is supposedly bettering. Apple always clearly said ,that they are making the best products they can. iPhones start at $450 ,iPads start @ $330 iPods @ $200. It’s even affordable in India. In India iPad has 37% of tablet market share. Those are estimated shipment, and from other Set of Data I say this is a wrong calculation. Japan has a huge uptake of iPhone 8, so while shipment remains in line with Apple's estimate. The product mix didn't, and hence the drop in Revenue. Majority Japanese don't like big iPhone, which is why iPhone XS Max wasn't performing. They also prefer Touch ID over FaceID, another reason of reluctance moving to X+ Series. Apple needs to start catering features to specific countries. A gaming push would skyrocket iPhone marketshare. Funny how Sony is #3 as I think a partnership with Sony PlayStation would help Apple. For example releasing the PS1/PS2 catalog on iOS would be great or a subscription service on iOS/tvOS. Of course a Nintendo buyout would be amazing for everyone. Handheld gaming is huge in Japan. If Apple gave 2 shi** about gaming, more people in Japan would pay the extra $$ for the added "gaming handheld". Apple could also integrate LINE(A popular Japanese text app) into iMessage or acquire the company. Line began in summer 2011 as a communication system for NHN Japan employees. It then saw explosive growth when released to the public in June of that year. By 18 January 2013, Line had been downloaded 100 million times worldwide. The number expanded to 140 million by early July 2013 and to 200 million by July 21. As of June 2016, Japan claimed 68 million users while Thailand had 33 million. As of February 2014, Indonesia had 20 million users, Taiwan 17 million, while India and Spain had 16 million each. NHN company representatives announced plans to reach 300 million by further expansion in East Asia, Spain, and Chile. In April 2014, Naver announced that Line had reached 400 million worldwide users, and by 2017 this had grown to 700 million. Oh yeah forgot to mention that. Why Apple doesn't release a new SE that's all screen is beyond me. It's so damn obvious. Something like this with good games would crush the Nintendo DS and PS Vita in Japan. Both of which are still seeing great sales in Japan because of good games. Long live the SE. Best iPhone form factor ever (well, so far anyway). It's one of my favourites too and I'm sure many feel the same way. Personally I prefer larger screens but the flatter edges definitely had appeal. I saw some mock ups of an SE with notch and they looked gorgeous. A decade or two ago, I would agree Japanese cars were the most reliable. Now, most of the big auto manufacturers in the world are selling pretty reliable cars. Auto manufacturers are all sourcing parts from the same places so personally, I don't think Toyota for example is more reliable than any other big brand of vehicles. I think another huge factor for the popularity of the iPhone in Japan is not only by their love of western culture, but the hatred of South Korea in Japan. 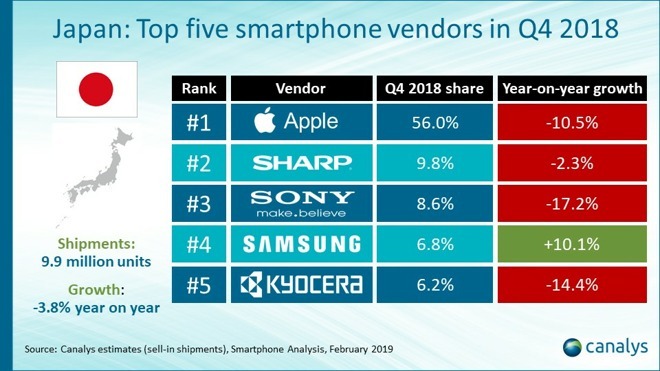 It doesn't surprise me Samsung is near the bottom of the list for market share in Japan.